You have a great family made up of your awesome husband and two beautiful children. Life is beautiful but there’s just one thing wrong. You’re not happy with yourself. Imagine looking at a stranger every time you look in the mirror. Seeing a body that isn’t yours and not recognizing yourself anymore. That is where my client Ana Munoz was before she became part of our Fit Body Boot Camp Ohana. On top of that Ana suffered from sciatic pain for years which made it impossible to carry her son for more than a few minutes. Ana pretended to be happy and ignore how she felt about the shape she was in. She even tried wearing body shaping garments “but wearing those in the summer was just miserable” – then she reached her breaking point. A friend of hers got her all excited about skinny jeans that stretch. So she bought a pair and pretended to be happy but there was something gnawing at her deep down. Ana didn’t want to keep buying bigger sizes or super-stretchy jeans. That’s when Ana got an email from us and made what she said was “an important and life-changing decision” she became a client. She sweated through her first day, then her first week, and her first month. It was obvious she was on a mission and would not be stopped. I remember Ana always texting me with questions asking what she should do next and what she should be eating. The best part was when the first text came through about her clothes fitting looser, then another about 18 pounds coming off her. Ana took another big step for herself by participating in our 6-Week New Year Revolution Challenge at the beginning of the year. In that 6-weeks Ana’s focus and determination went to the next level. I could see from her food journals that she was nailing her nutrition and my coaches would tell me how hard she worked at 5:30 in the morning. In 6-weeks Ana melted away close to 20 pounds, winning our New Year Revolution Challenge and putting her weight loss at 38 pounds! Being the hard-charger that she is Ana stepped into deeper water by joining our members-only Game Changer transformation program AND guess what? 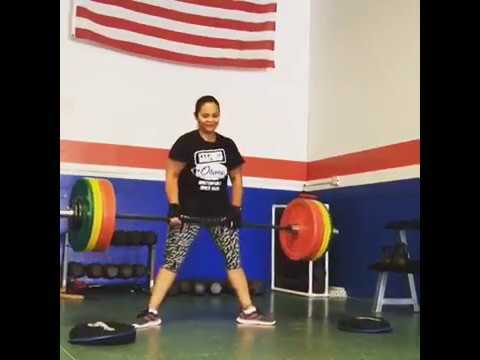 She set a personal best with her deadlift of 200 pounds, achieving her goal of doing unassisted pullups, and melting away another 12 pounds putting her total at 50 pounds lost and 8 sizes! She can also carry her son now as long as she wants with no hint of sciatic pain. If you’ve been finding yourself staring at a stranger in the mirror and pretending to be happy about skinny jeans that stretch give me a call at 661 505-8193 and I’ll hook you up with 3 free sessions to get you started on your own life-changing path. This entry was posted on October 14, 2016 at 5:00 pm. You can follow any responses to this entry through the RSS 2.0 feed. You can skip to the end and leave a response. Pinging is currently not allowed.